A press release yesterday from NASA (HERE) was picked up by various news outlets because it referenced problems with a prior work that attempted to identify the source of an asteroid that may have killed off the dinosaurs. While the release and the related research paper is interesting in itself I was more interested in a related question: how did these researchers determine the age of these asteroids? I did a little bit of research and found the answers quite fascinating. Here we have another example of observations and reports that bombard us everyday that speak of the age of the earth. It also fits well with some of my recent posts about the apparent age argument that is used by some Christians to reconcile the problems of astronomical phenomena and the age of the earth. How so? What caught my eye in this release was the reference to asteroid families. 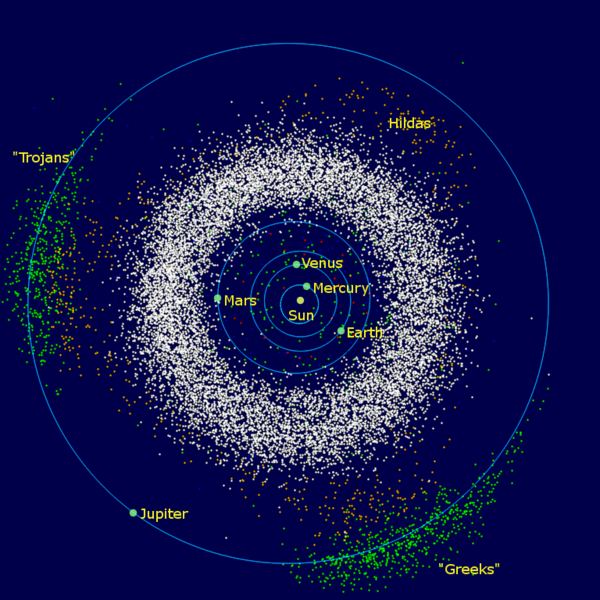 You might think of the asteroid belt as a random assortment of asteroids but in fact there are groups of asteroids in that belt and many have been studied in some detail. These groups are referred to as families when it is evident (by orbital similarities, composition, dust thickness etc.) that the asteroids are related by a common ancestor. In other words, when it is apparent that there was in the past a large asteroid that was broken apart presumably by a collision with another. In the case of the family of asteroids in the press release over 1000 individual asteroids were identified as fragments of a once larger asteroid. Inferring backward to when all the pieces were put together they estimated an age of 80 million years for the family. There are some assumptions involved that leads to quite a bit of uncertainty but 80 million years is a long time nonetheless. The inner solar system showing location of asteroid belt. It looks dense but in fact most asteroids are separated by millions of miles. Another asteroid family, the Karin family, is much more interesting because more is known about it. Here over 90 pieces have been identified but more importantly 13 of the asteroids have had their orbits carefully mapped and using that mapping scientists have run the orbital patterns backwards in time to find the time when all 13 pieces coalesced at on point in time. That time was 5.8 million years ago with only a 0.02 million year variance in their measurements. This family is the “youngest” appearing family known in the asteroid belt between Mars and Jupiter. An additional evidence of the “youth” of this family is the high reflectivity of the asteroids due to their lack of dust buildup on the individual members. They are also clustered much closer to one another in space than other much older asteroid families which have had much more time to disperse. Eventually these families disperse to such an extent that there members intermingle with the remnants of other families and just look like a random jumble of asteroids which is the appearance of most of the asteroid belt. Asteroids families such as these are pretty remarkable evidence of the great age of the solar system. While geological features on earth are explained away as being young by creation scientists, features of the solar system are harder to fit into a young universe and thus the temptation to use an apparent age argument is much greater. In this case the formation of these asteroid families within a short time would require a miraculous intervention since the pieces of these asteroids are drifting away from each other very slowly, as measured today. Thus for them to have achieved the great distances between them we see today they would have had to be traveling very fast in the past but then slowed to their present speed. But what would cause them to slow in the depths of outer space? I suppose the apparent age argument would go that the God created the pieces of these large asteroids in their present orbitals but here we have a case of those orbitals being able to be rewound to demonstrate a time when all the pieces were together. In the apparent age argument there never was a real-time when they were together but the pieces have the appearance of looking as if they have the same parent. Henry Morris and other YEC types have tried to separate apparent age into two types. I will elaborate on these in other posts but for now they attempt to draw a distinction between “essential appearance of age” and “deceptive appearance of age”. Essential is also couched in terms like necessary or superficially to give the idea that there isn’t a specific history embedded in an object but only the necessary appearance of age like a full-grown human who would appear to have grown from a baby. I can’t even describe the differences because really they make so little sense to me but for astronomical features, light coming from a star that is created old is fine but light coming from a star with information recording an explosion of that star that never happened is not ok and is rather deceptive. In this case I would imagine that a set of asteroids with orbits and characteristics that attest to a past history as one unified object millions of years ago would have to be classified as deceptive. This is probably why so many YEC types try to find other explanations for these phenomena that include their whole real history contained in less than 10,000 years. That is a tough assignment!